I made this top in September and I’m still in love with that goldfish print. The pattern is Juice Boxes. It’s a very bright quilt. :) I quilted it with straight lines about 1 1/2” apart. The back and binding are from JoAnn’s. Hope your having a nice start to your March!!! It's so gorgeous and happy! Oh the goldfish are fabulous! I can see why you love that goldfish print! Cute! Love it! The colour scheme works really well and the simple design is perfect to showcase those über cute goldfish! SO cute! Love the pattern and your fabrics are so bright and cheery ~ gotta get me some of that binding fabric for sure! Hello, this is my first visit, I've just had a lovely time looking around. Your work is amazing! I'm new to patchwork, bought my first fat quarter last week, I think I'm going to find your blog very helpful. Going shopping tomorrow to buy some fabric to make your camera strap!! Kindest regards from the french alps. Very nice finish ! Gotta love that straight-line quilting ! Love it!! I've seen the backing fabric at Joann's but I haven't seen the binding and I was just there last week…. I think I need that…. totally my colors! Great quilt. So simple, yet such a classy look. 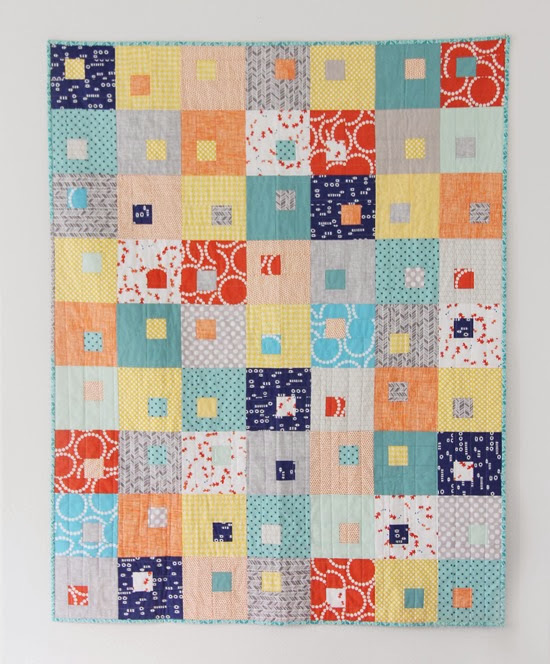 I really like the playfulness of this bright and happy quilt. Great finish!! Una vànoba molt bonica i alegre. this is a really nice and pretty quilt. thanks for sharing. I agree that Feb could have been way shorter. Welcome March! Such a cute little quilt. Enjoy your cakes this month. 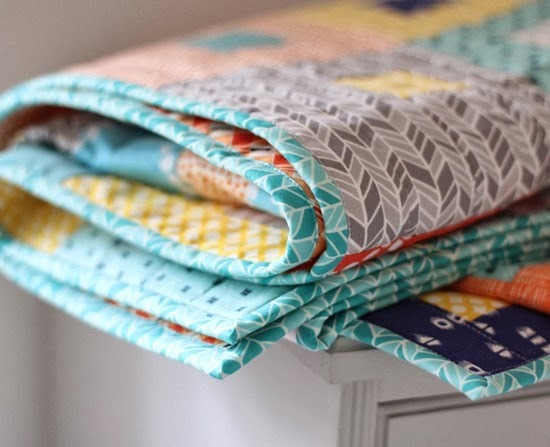 I love that quilt–especially because it's all about the fabric. Straight line quilting is also my favorite. I can see myself making one of these. 1. The straight line quilting is just the ticket. Love it ~~ especially the back! 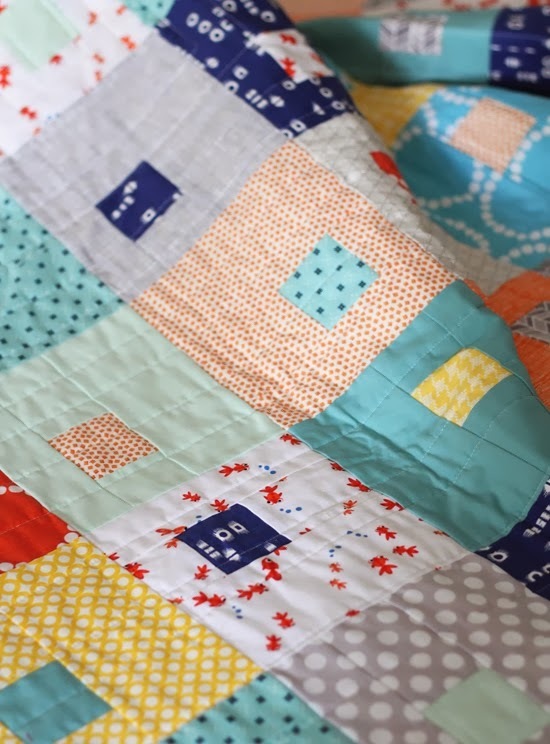 Your quilt is gorgeous—so cheerful. My birthday is March 12, and my dad's is March 13. Bring on the birthday cake, Baby—I will be wearing my stretchy pants with the elasticized waistband. Juice Boxes? 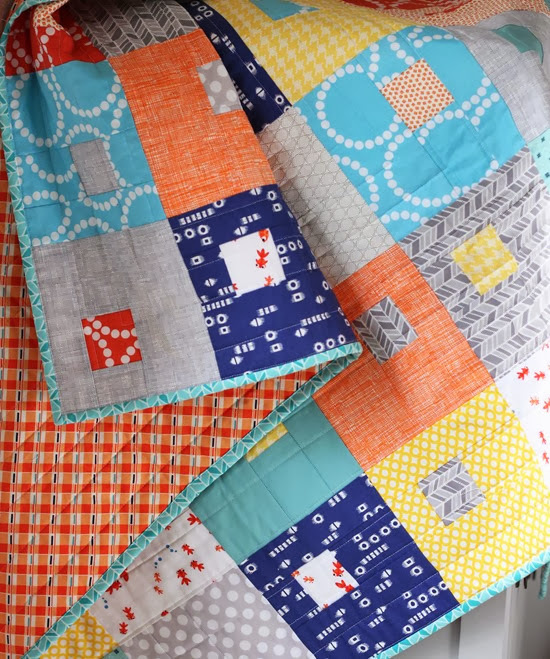 I love the bright colors of this quilt! I read your post about your daughter turning two. Maybe you should have one more… ;). you are going to LOVE that quilt baster tool! It is absolutely AWESOME!!! BTW I always love your stuff.